Used for Week 6: Texture- with the Compositionally Challenged Group. 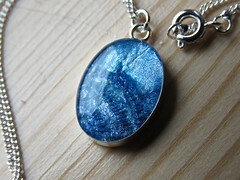 A piece of blue cloth soaked in resin is cut to shape and put into the pendant. Layers? of more resin are added to get the final slightly domed shape. Hang on a necklace and wear. Very pretty it is too. A gift from my son to his mum.